Boil stock in a large pan over high heat. Add garlic, curry paste and mint. Reduce heat to low, cover pan and simmer 4-5 minutes. Add peas and simmer another 4-7 minutes. Transfer mixture to a blender or food processor and process until smooth. Season with salt and pepper to taste. Heat oil in a heavy non-stick skillet over medium-high heat. Saute mustard seeds until they start to pop. Pour oil spice mixture over soup and serve. 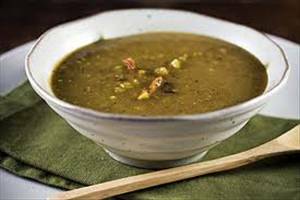 There are 92 calories in 1 serving of Thai Pea Soup. Calorie Breakdown: 12% fat, 62% carbs, 26% prot.